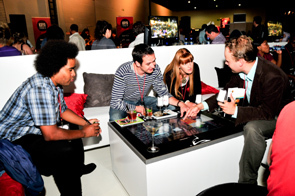 Digital convergence has been taken to a whole new level of interactivity, by South Africa’s pioneering bar service company, LiquidChefs, with the launch of the innovative LiquidChefs MiBar (Multimedia Interactive Bar). At this year’s Whiskey Live Festival, held in Cape Town from 4-6 November and in Johannesburg from 11-14 November, the MiBar and other interactive elements enabled LiquidChefs and J&B to engage with consumers in ways that have never before been seen on our shores. The MiBar was one of the highlights of this year’s show, with everyone coming to find out what their LiquidDNA is. 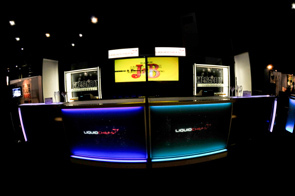 From touch registration points, consumers moved to the MiBar, which scanned their handprints to reveal which one of the specially-developed LiquidChefs J&B Whiskey Cocktails illustrated their LiquidDNA. Modern, Visionary, Sleek, Streetwise, Innovator and Maverick were the names of the cocktails which represented six different personalities associated with each person’s LiquidDNA. 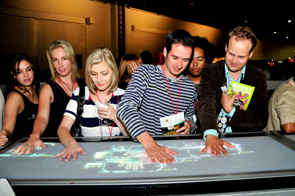 Interactive touch champagne tables had everyone surfing the Internet, finding their images on the LiquidChefs Facebook Fan Page and Tweeting in real time off the stand. Images were uploaded onto the champagne tables live via iPhones and cocktails ordered straight off the tables, showcasing the latest examples of how LiquidChefs innovates liquid lifestyles. In partnership with iTouch International, all software is developed locally, enabling full customisation of every event, at exceptionally affordable rates. For guests, the ability to interact with their much-loved social media platforms in real time, sharing content and connecting with each other instantaneously, simply fits in perfectly with modern, permanently-connected lifestyles. Your creativity sets the limit as LiquidChefs opens up the future of brand, corporate and private events, with new ways of engaging and entertaining guests. To find out more about the developments at LiquidChefs and any future events, become a Fan of LiquidChefs on Facebook or follow TheLiquidChefSA on Twitter. LiquidChefs UK – Summer ’09 done the right way LiquidChefs ‘breaks the ice’ in the Antarctic!